Congrats again, Jaime and Sophia, and thanks so much to everyone who entered and helped spread the word about Lucky Me, Lucky You! Gorgeous banner created by crazy-talented Tracey Neithercott! The brainchild of writer/blogger/all-around-awesome-person Sara McClung, Blog Me MAYbe is a weekly blog format for the month of May, an easy schedule to follow with topics built right in. Of course, if posting every day sounds like too much, or if you miss a few days, or only do a couple posts a week, no biggie. Blog Me MAYbe is all about ease and fun! You don’t have to worry about following every blogger who participates or commenting on everyone’s daily posts (though if you want to do that, feel free!). The intent of Blog Me MAYbe isn’t to gain followers — although that could very well happen — but to branch out, make a few new friends, share information, and get into the head space where ideas for blog posts flow freely. Fun, right?! I’m already committed to participating, as are Sara, Cambria, Tracey, Jessica, Lola, Alexandra, and Alison. 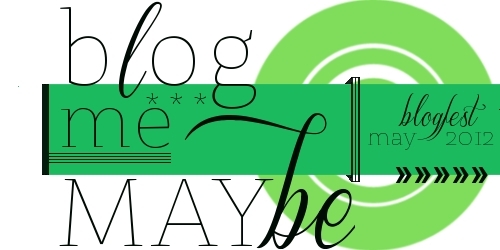 Blog Me MAYbe begins on the first of May, so head over to Sara’s blog if you’re interested in signing up, and feel free to grab our banner or the button in my sidebar to use on your own blog. Tell me: Will you participate in Blog Me MAYbe? I’m intrigued! I’ve only done a handful of blogfests, but this one sounds like it could be fun. 🙂 I’m in! Yay! Glad you’re joining in, Ian. Blog Me MAYbe will be really low-key and fun. There’s a sign-up over on Sara’s blog now. Looking forward to your posts! Oh, great, Lindsay! If you haven’t happened upon it yet, there’s a sign-up over on Sara’s blog. Looking forward to your posts! Yay! Congrats to Jaime and Sophia! Yes! We need to set a lunch date in stone ASAP… So looking forward to it! And I saw your name over on Sara’s Blog Me MAYbe link list — glad you’re joining in (and glad to give you a method to avoid homework :)). This sounds like a lovely idea! Especially the concept that you’re doing it to “get into the head space where ideas for blog posts flow freely”, and not for followers. (Also, that is one gorgeous blog button.) Also, May is my favourite month of the year, so bonus points for that. 😉 Hope you have fun, Katy! I’ll see if I can keep up with another blogfest… haha. Tracey made the blog button… Isn’t it gorgeous?! And you should definitely join in… Blog Me MAYbe is totally low-key — zero pressure to post every single day. I look forward to seeing what you come up with! Yes, I totally got that “Mother, May I?” vibe as well. I hope you’ll join in, Liz… It should be fun! Yay! So excited! Also, Sara has a linky up on her blog for anyone who wants to sign up! Thanks, Alison! My post went up before I (woke up and) visited everyone else’s. 🙂 I adjusted, and I’m sending interested participants Sara’s way. So looking forward to this! ♥ ♥ ♥ ♥ So glad you came up with this awesome idea, and thanks so much for including me. Looking forward to May! I just emailed you, but I wanted to say thank you here too! Can’t wait to see what you come up with for Blog Me MAYbe, especially Wednesday’s post: you always come up with interesting questions. And I’ve signed up on Sara’s linky to join you all in the Blog Me MAYbe blogfest!! Sounds like a great idea! Yay! So glad you’re joining in, Erin! I think Blog Me MAYbe will be tons of fun! Nice. I would do it but since I am already doing A-Z in April and its crazy (last months of college)…I don’t think I could handle another blogging fest. 🙂 But I’m eager to see what you come up with for each day, Katy! Oh, good! I’m so glad you’re joining in, Rebecca! I’m looking forward to your posts! Yay! Does this mean you’re passing the giveaway-winning torch back to me??? 🙂 I’ll email you as soon as I’m done here. Thanks a bunch! This Blog Me MAYbe idea is fantastic! I only wish I was around for the first 2/3 of May (we’re away then). I’m not sure if I’ll be doing any blogging while we’re gone, though. I do plan on MAYbe (←see what I did there?) jumping in for the last part of the month. The topics for each day are really great, and I’m been loving some of the structure of A to Z. The winning torch is yours… FOR NOW! And yes, definitely join in on Blog Me MAYbe anytime you can. It’s low-pressure and fun, and I’ll be looking forward to your posts! I’m going to pass on the May blogfest as the A-Z is a lot of blogging for me! But maybe next year. This sounds great! I’ll definitely be participating. Great! I’m looking forward to your posts, Kenzie! I signed up for the Blogfest. Glad I popped over here from the #AtoZchallenge. I was wondering where I would head for inspiration once I was done with THIS challenge! LOL. Seriously! Thanks for bringing it to my attention!